I’m going to put it out there from the start. This film blew me away. I loved it. Now, I’m not one of your die-hard, Danielle Radcliffe fans. He seems like an nice enough young man but I didn’t read any of the Harry Potter books, I’ve never really seen any of the movies and the little bits that I’ve caught have been accidental – at someone’s house when their kids have been watching. I’ve nothing against it. It just isn’t my thing. (Although, I do really like J. K. Rowling, ‘as a person’.) I’m aware that Mr Radcliffe has been going out of his way to choose films that would differentiate him from his Hogwarts character. Understandable, I’d thought. Good for him. But I wasn’t particularly interested in his acting career. However, he is undoubtedly very, very good in this film. Very good indeed. As are his main co-stars, with Dane DeHaan deserving a mention in particular. However, they are ALL very good. Kill Your Darlings is the true story of the poet Allen Ginsberg’s time at Columbia University in New York, which ended up with him being embroiled in a murder. With a poet for a father, the young Ginsberg was confident with literature but otherwise very quietly determined and shy. From a poor Jewish background and with a mother who was mentally ill, it’s a leap for him to apply to university and he goes full of hope and ambition. Ginsberg soon discovers that university is full of bigotry and restrictions – both in terms of how lecturers and most other pupils think and in how they are allowed to express themselves. To the extent that work of writers perceived as being corruptive – such as James Joyce and Henry Miller – are denounced and their books kept under lock and key. Everything changes when Ginsberg meets Lucien Carr, an idealistic senior poetry student with maverick tendencies. Lucien introduces Allen to the ‘other’ New York – the infamous Greenwich Village, jazz clubs and alternative friends, such as the legendary drug taking William Burroughs and ladies man Jack Kerouac. Against a backdrop of excessive drinking, drug taking, sexual awakening and partying – as well as some great music – the four of them declare war on the staid, traditional old order and vow to make a permanent place for themselves in history by setting up The New Visions – a group and way of thinking that would later become known as The Beat Generation. A new movement is born and Ginsberg’s original ambitions for university and life fall by the wayside. Core to this story and amidst all of their disruptive – and self-destructive behaviour – is the constant and slightly unnerving presence of David Kammerer, Lucien’s ‘mentor’. As the film progresses we discover the significance of his presence and the long term impact that he will have on all of their lives. A nice little writing touch is the way that characters are introduced – an additional scriptwriting challenge for a film where the main characters are so famous. The writers, Austin Bunn and John Krokidas, had me so engrossed in the plot that I didn’t immediately realise the identify of each new character as I met them. Which made it all the more satisfying each time the full reveal came. One of the great side effects of this film is the insight it gives into William Burroughs and Jack Kérouac’s lives, as well as into Ginsberg’s underlying moral code which, in the end, he couldn’t deny. 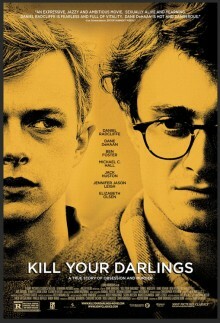 As I said at the start, Kill your Darlings blew me away. Although, perhaps not for the reasons that you might assume. When it was over, I needed to sit for a while and ruminate over what I’d just seen and its implications, in terms of what the film’s creation and distribution must mean for those connected to this story and their families. The film very fittingly plays out to the Libertines’ “don’t look into the sun” – a song written and performed by two young male friends, whose relationship turned sour against a backdrop of excess. I totally recommend that you go to see this. And do hang around for the credits at the end, as you’ll see some wonderful original photographs of The Beat Generation at their prime. 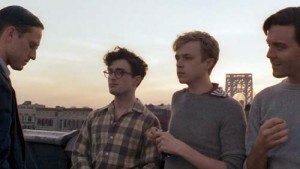 This entry was posted in Film, Latest News, London Life, Review and tagged Allen Ginsberg, Beat Generation, BFI, Columbia University, Dane DeHaan, Danielle Radcliffe, Greenwich Village, Jack Kerouac, London Film Festival, Lucien Carr, New York. murder, The New Visions, William Burroughs. Bookmark the permalink.